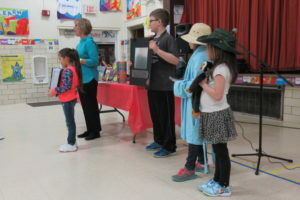 A scene from a recent LITERACY NIGHT: Great time working with K – 5th grade students as we discussed — and they acted out a skit, about how an author researches material for a new book. In fact, I think I’ve found the perfect crew to dig up some new information for my next book project . . . Super Students! Join the Safari: FUN with Animal Facts!